The University of California San Diego (UCSD) needed office space, and they needed it fast. 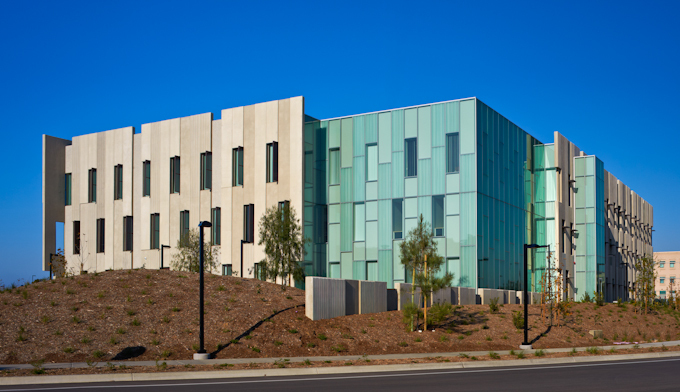 With the new Sulpizio Cardiovascular Center set to open in 2011, the University was in dire need of space for the office, administrative, and clinical research activities supporting that facility and the needs of other Health Sciences programs. Considering the budget available for such space and the timeframe they were working with, an initial proposed solution consisting of twelve to fifteen temporary modular buildings was discussed. Bearing in mind the investment that would be required for these units and the reality that the solution would only be temporary, John P. Mattox AIA, LEED AP, Senior Director, Healthcare Project Management for UCSD’s Facilities Design & Construction recommended considering an alternative, tilt-up concrete construction. Mattox, having a great deal of experience with this method as an architect, suggested that a building utilizing tilt-up concrete could be constructed within the difficult budget and timeframe. However, the suggestion was met with reservation from the Design Review Board and other design review agencies on campus. 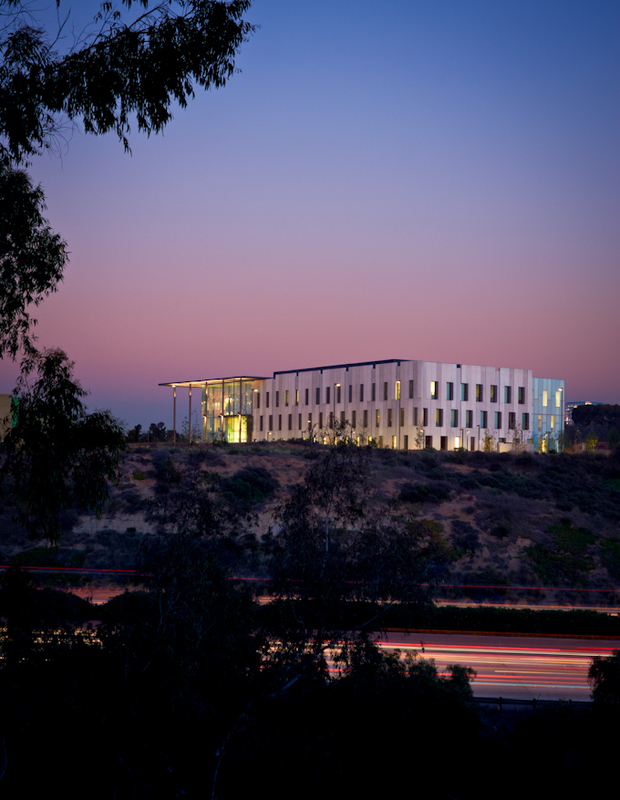 UCSD, like most good institutions of higher education, takes their architecture seriously and holds certain design standards to ensure development of the campus is in harmony with the existing architectural icons anchoring it. “The Design Review Board expressed serious doubts as to whether a tilt-up building would measure up to the high standards of design that the university has come to expect,” said Mattox. Nevertheless, a request for proposals (RFP) for the East Campus Office Building was released. Knowing the project would be under some scrutiny, Mattox was impressed with the design team’s attention to every detail, specifically, their awareness and acknowledgment of the building’s context. The project mediates between the natural, rustic character of the campus edges, and the highly designed character within the central core. The combination of concrete and glass comments on this relationship and helps to ground the building in its context. 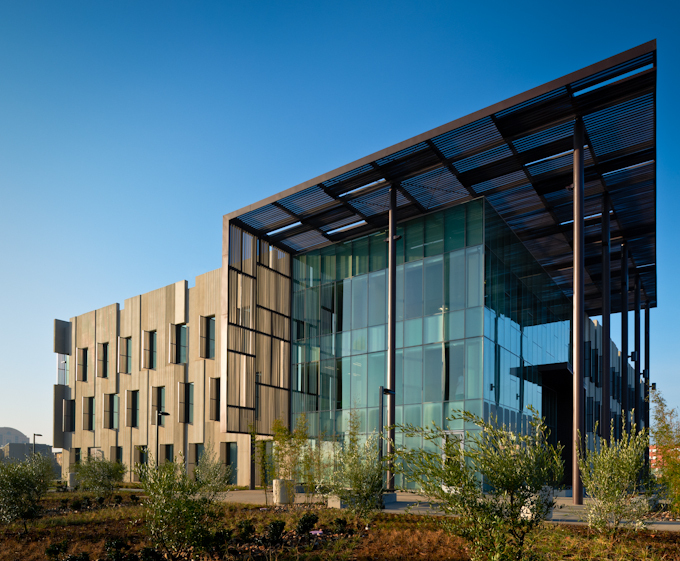 The relatively rough concrete walls address the canyon side of the site, referencing that geology, while the clean and sophisticated glass façade reflects the formality of the campus landscape. The project is surprisingly light and airy considering the majority of the exterior is composed of concrete walls with punched openings. The verticality of the openings accentuated by the projecting vertical sunshades, coupled with the tall slender composition of texture and relief, break down the scale and weight of the sizeable elevations. The shifting of the motif vertically denies a strong horizontal reading, which is often dominant in traditional office buildings. This strategy extends to the top of the structure where the horizontal line of the parapet is broken. The syncopated rhythm of the punched openings and metal sunshades further denies a static reading, encouraging movement along the face of the building, taking the eye up and down as it moves along. Just as the façade shifts vertically in elevation, the various levels of relief provide complimentary movement in plan, breaking the flat plane of the wall. 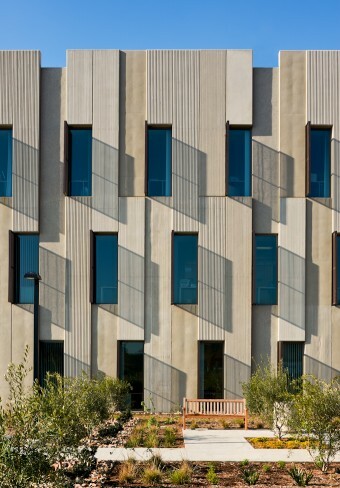 While the concrete is not painted, the perceived value and even hue of the material changes as deeper textures create shade and shadow and varying levels of sandblasting expose different aggregates. The unitized glass curtain wall system mimics the pattern and texture of the concrete. 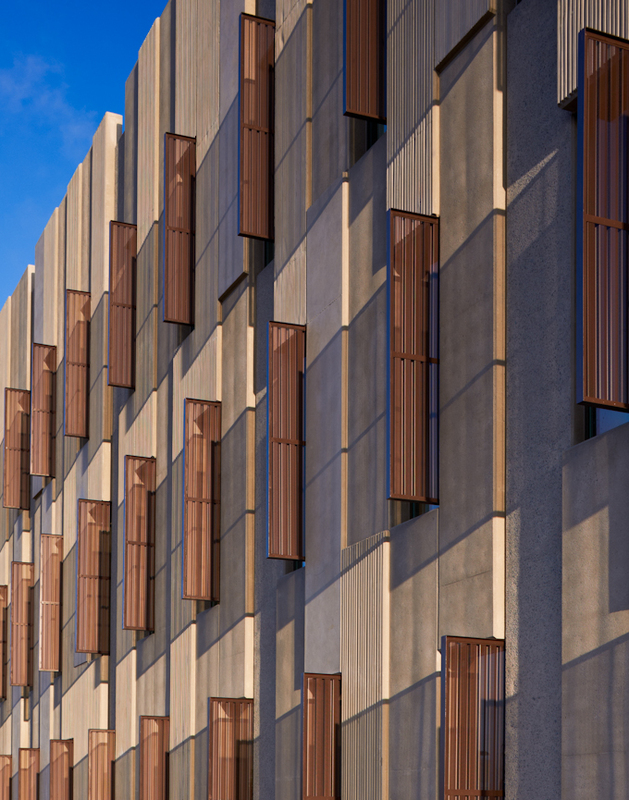 Fritting on the curtain wall panels at the southwest corner of the building mirrors the striated texture created by the formliners in the concrete panels. Again, the various treatments produce changes in the appearance of the glass. The process of selecting and testing the finish for the panels was aided tremendously by the early involvement of both the formliner manufacturer and the tilt-up subcontractor, Minegar Contracting, Inc. Presented with an architectural rendering conveying the desired composition and texture, Mike Dahlquist, President of Minegar, worked closely with the team to realize the design intent. Miyamoto International oversaw decisions of panel thickness and joint locations to ensure panel weights were manageable for the crane scheduled to do the lifting. As construction began, Minegar built an off-site mock-up panel showcasing multiple formliner variations and various levels of exposed aggregate finishes. “This experiment allowed us to balance design with budget before committing to an on-site mock-up where we fine tuned the finishes,” explained Heffernan. The structural thickness of the panels is ten inches, although the thickness varies from twelve to six inches thick at certain non-structural locations within the panels. This varying thickness coupled with the offset window openings required additional engineering. “A more sophisticated finite element structural analysis was performed on the spandrel elements of the panels to optimize structural performance,” explained Crosier. Each panel was divided into three-foot sections. Each of those sections incorporated two distinct textures and two different levels of relief. The recessed areas of the panel were formed at varying depths with masonite decking. Because there was not enough space on the building slab to cast the panels, a fairly common situation on projects with a relatively small footprint compared to wall area, recyclable casting slabs were planned at convenient locations. A well-organized panel layout and carefully thought-out sequencing allowed all panels to be set efficiently even though crane access was not possible on all sides of the project. The structural system for the project’s floors and roof consists of metal deck with lightweight concrete fill, supported by long-span steel joists. The walls are tied into both the floor and roof systems via dowels embedded in the concrete. “The panels are connected to the continuous footing foundations through the use of dowels into pour strips and then to the continuous footings with hold-down anchors installed at panel ends where seismic forces create uplift,” said Croiser. Programmatically, the project is fairly complex. The 75,000-square-foot building features office and meeting spaces on all three levels. The main floor also includes exam rooms and a café. The new medical office space will hold a first floor Clinical and Translational Research Institute consisting of exam rooms, a pharmacy, treatment rooms, blood draw rooms and related support areas including waiting rooms, restrooms, and a reception area. Tilt-up was a great fit for the project, considering the large number of private offices requiring a window. “Because these offices all needed to be the same size, and there were so many that they filled almost the entire perimeter of the building, we could provide one punched window per office,” said Heffernan. “This kept the glass to wall ratio much lower than if the building was all curtain wall like a conventional speculative office building and reduces the cooling load.” Beyond the environmental responsibilities of the structure itself, the new facility will improve efficiency and enhance collaboration by consolidating related research and associated staff that were previously scattered among several locations in one building. 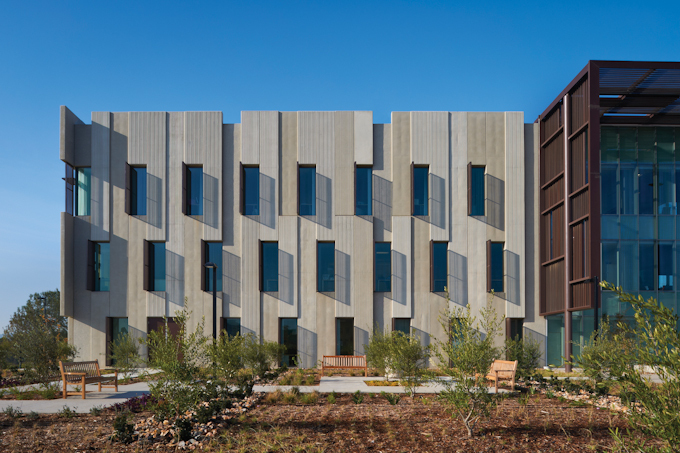 The $25 million facility is the very first academic building on UCSD’s campus to employ tilt-up concrete construction. The design excellence achieved is just one more example of the potential of tilt-up concrete construction. “The project is very well done,” but not to Mattox’s surprise; “I knew we had the right team on the job!” The majority of concern and criticism related to the building’s construction method has subsided and, for many, it is now considered to be a very attractive addition to a campus that has prided itself in excellent design and a beautifully built environment. a pioneer in creating great places that enhance the quality of work and life. Founded in San Francisco in 1965, today Gensler employs almost 3,000 professionals in 38 major cities throughout North America, Europe, and Asia. The firm has over 3,500 active clients in virtually every industry and delivers projects at every scale. Miyamoto International is a global earthquake and structural engineering firm that provides critical services to help sustain industries and communities around the world. 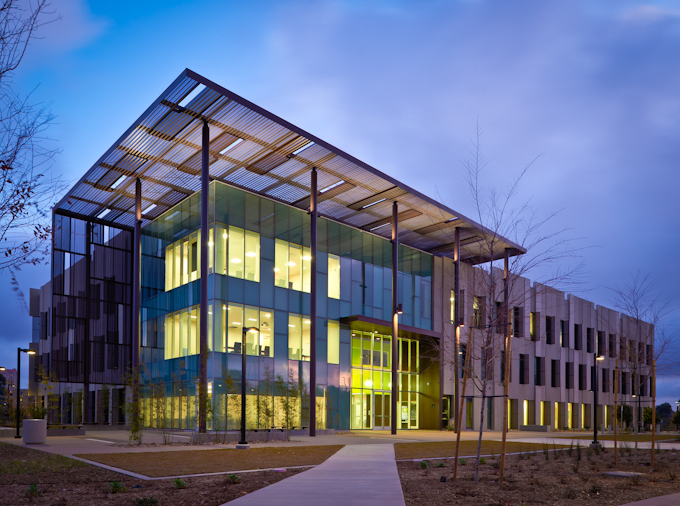 Miyamoto specializes in designing High-Performance Earthquake Engineering solutions that reduce lifecycle costs and produce a positive net impact on a structure’s operation. Their unique D5 Design™ methodology helps Miyamoto tackle some of the most challenging projects in the world, from diverse offices throughout the Americas, Asia, and Europe. Miyamoto clients include government agencies, private-sector organizations, developers, architects, and contractors who desire highly effective and sustainable technical solutions. C.W. Driver is a premier builder serving the Western United States since 1919. The company’s distinguished history spans nearly a century. As leaders in General Contracting and Construction Management services, we remain on the cutting-edge across a broad spectrum of industries, including education, healthcare/biomedical, entertainment, retail, industrial and civic. Landmark projects, historical renovations, hospitality industry and occupied campus programs have distinguished us as leaders in our field. C.W. Driver has offices located in Los Angeles, Irvine, Ontario, San Diego and San Mateo. Minegar Contracting, Inc. has been a leader in the concrete industry since its inception in 1977. The range of work performed and completed includes concrete tilt up, foundation and slabs, parking structures and mid rise buildings. Minegar Contracting, Inc. is a union contractor, signatory to the Carpenter’s Union.